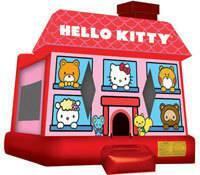 Are you having a Hello Kitty themed party or just looking for a great Bounce House for your event? Hello-Kitty is the perfect moonwalk for your event. This item goes fast so book early for your event.